The easy clean design lets you wipe it down with ease. The Baby Snug is also lightweight and portable so you can entertain baby at home or out and about. 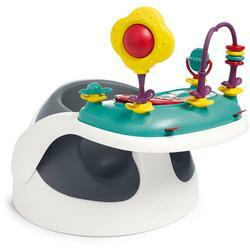 Use the large suction pad to securely attach the play tray to the baby snug. safe mirror. Textures, colours and materials aid stimulation for a fun playtime. Large suction pad on the play tray ensures that tray is secured to surface. 3 toy arrangements change with your childs development. The toys are fixed, meaning baby cant drop or throw them.